Posted: Tue Jan 27, 2009 8:28 am Post subject: Canadian Toy & Hobby Fair: Summer/Fall 09 Revealed! Apparently these are not leaked. Vague or not, this topic says that even these pictures ARE leaked and are in violation of the RtB rules enforced so strongly on this site. ... This even though TBB have asked and received confirmation from LEGO about these sets. TBB posted that they received confirmation from LEGO about posting these after we made our stance known. Given the turn of events at TBB, I'm gonna tentatively say that it's okay to talk about these. But don't be surprised if we have to correct ourselves later on. Apologies in advance if that happens. Well, could a Mod maybe delete the thread I made about these sets, since it actually wasn't breaking a rule,, thus getting rid of my shame and agony. As I pointed out to Chief in a PM on this very subject ... if these sets are so secret they were protected by a big fence at this public Toy Fair, why did they let someone take pictures!? Being a devoted fan of LEGO and STAR WARS it allways make me sad to see how often these toy fair display are thrown together with little or no respect to whats depicted in the scene. Han is not correctly attatched to the TaunTaun. The horns points straight up on these pics and parts of the front on the AT-ST seems to be up side down. The feature I really hope survives to a set release are the cool ski goggles for the rebels. Yes, I think we all know that this is a set that's available now. I guess the writer wasn't 100% aware of what was out now and what was out in the summer. If you look closely Han isn't pushed all the way in the saddle. You needed to look closely to see THAT? How did I miss this!? I could have gone! Oh well next year maybe. Are you a toy retailer? Because this show is primarily for Canadian toy retailers. I hope it stays that way. I like the flexibility such a design offers. My brother raised that suspicion last night when I saw the pics; that it could be Frankenstein's headpiece, that is. It's clear that it's a seperate piece, though. Just wondering, why is there a clone in the Shuttle? Technically the clone is only there when there are no droids left, and when the shuttle is long forgotten. 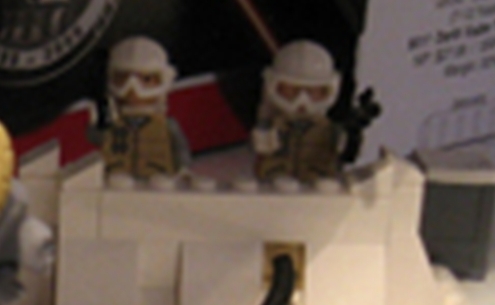 I couldn't help but notice the goggles on the Rebel minifigs in the Echo Base set. Are those new? /me wants Chewbacca PARTS PACK!!! If those are new ski goggles, that's one more reason for the set to be impossible to find. Chuckled at the whip as a power cord. The Y-wing didn't have a cockpit for Ahsoka. Hmm, do the designers think she's the annoying teenage sidekick? Ooh, the blonde's hair has a front curl. Is that new? I had a close look, and yeah it does look like new ski goggles. No but I do have relationships/connections here with the local retailers I'm sure I could be an "employee" for the day. Yea I hope so too. But it looks like they at molded to the head piece. But you never know. And all I know is I'm getting endor and hoth maybe the ventor but it looks really small so I'll have to see it. Anyone got a measurement of the length of the ventor? That looks like a regular rebel helmet, but with new ski goggles IMHO. These ski goggles appears to be separate from the helmet. There is pics with the goggles over the eyes as well as on the helmet. It is way too early to speak a lot about every little detail seen in these pics I think. What we can say is that even if some of the nice bits doesen't make it to the release we still can look forward to something quite different in the LEGO SW line. Original Trilogy sets with real attention to detail and respect for the source material. And if those 70�s style ski goggles are real, the circle is complete! Seems like there's an eensie bit of shadowing there that could indicate that they're separate visors. Now that I see them way closer upthey do look seperae from the head piece. Well I'm still gonna get that set fo sho! ah now who doesnt love new lego starwars kits in the after noon. Frakking low res "preview" shots... same complaint as ever. I'm hoping they're exactly what we think they are but there's always a chance it will end in sadness. Still. My Ice Planet Special Forces guys would love to get their hands on those. I was thinking the same thing, Don. I tried my hand at building a couple 'figs inspired by your idea. Those would look badass on 'em!